Horrible breath or trouble chewing is a sign that your pet needs dental care. 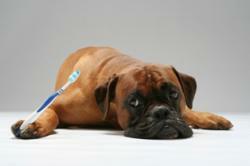 Often, dental care is neglected for pets and becomes the most overlooked health problem they encounter. Our services are designed to offer the care and dental procedures your pet needs to continue an active and healthy lifestyle. Periodontal disease (PD) is singularly the most common health problem for small animals of all breeds. The chronic infection is caused by plaque buildup that typically is allowed to sit on the teeth during the first two years of the animal’s life. By the age of two, 85% of cats and dogs suffer from periodontal disease. PD is persistent and often is allowed to progress unsuspected until it causes a serious problem for the animal. Chronic PD can affect your pet’s liver, lungs, heart, kidneys and diabetic condition if left unchecked. To properly clean your pet’s teeth on a regular basis, he or she will need to be placed under anesthesia and each tooth carefully scraped from plaque and polished. While some services offer “anesthesia free cleanings,” there is no way to properly clean every tooth while the pet is awake. Professional dental cleanings are able to remove the plaque above the gum line and, more importantly, below (sub-gingival) the gum line where it is more damaging to the gums and teeth. Ultrasonic scaling removes the plaque bacteria and polishes the tooth to remove any abrasions in the enamel that could allow increased plaque buildup. During your pet’s cleaning, we will x-ray the teeth and check to see if any need to be removed or replaced. Tooth removal is encouraged when a damaged tooth is threatening infection, affecting other teeth or causing your pet pain. A tooth implant or crown can be applied in some cases to improve your pet’s ability to chew. More than 50% of your pet’s teeth lay beneath his or her gum line, so an x-ray is vital for knowing what exactly is going on. MRI might also be used to capture images of the soft tissues in the mouth. MRIs can be used to spot tumors or other problems that are in the soft tissue areas (non-bone). CT scans are also sometimes used to look at the head in 3-D to better view tumors or oral fractures. These scanning methods can help your vet understand how to best treat your dog and whether or not oral surgery is needed. Teeth Extractions – The most common form of dental surgery. Many pets will need damaged teeth removed and their gum lines stitched for faster healing. There are often alternative options, but occasionally, removal is in the best interest of your pet. Palatal Surgery – Defects that cause a lack of connection between palatine shelves, whether by injury (gunshot wounds, periodontal disease, foreign bodies, etc.) or by genetically driven developmental issues (“cleft palate” or “cleft lip”). Oral Tumors – Both non-odontogenic and odontogenic tumors may need to be surgically removed from the mouth to prevent cancer or reduce pain. Most frequently, unusual drooling, bleeding from the mouth, difficulty chewing or facial asymmetry is noticed by pet owners as symptoms of the tumors.